Chemical Safety is excited to announce the release of EMS 7 coming in early 2019. In a rapidly changing world of technology innovations, being able to quickly and efficiently navigate through software is at the cusp of consumer needs and tech requirements. Chemical Safety’s aim above all else in the release of EMS 7, is to empower EMS users with improved capabilities for navigating the system and getting fast, accurate results. Expanding upon the design of the already robust and powerful EMS 6, several key features will be incorporated in order to navigate, search, act, and improve the user experience with the interface. EMS already enables users to mix, match, and assign their own search criteria for fast and accurate lookup. EMS 7 will enable users to perform more in-depth searches with the implementation of a Sub-search feature. The Sub-search feature will allow users to further refine search results by narrowing the list with certain additional criteria after search has already been performed. For example, in EMS, an SDS lookup for acetone will retrieve a number results; in EMS 7 the user will be able to further refine the list to view in which locations acetone is being used and by whom. Chemical Safety is taking ‘Search’ to the next level; or in this case sub-level, even so, improvements to search capabilities and navigation do not stop here. Once a user has narrowed down their desired results, new Listview capabilities allow users to select one or many records directly from the list and then perform actions directly. Furthermore, Chemical Safety’s Structure and Sub-Structure searching tool allow lab personnel to search for and select chemicals by drawing or copying and pasting Structures in EMS. Navigating any software can sometimes be laborious, so Chemical Safety his offering more than just augmenting search capabilities and actions, but will also deliver a completely new Shortcut Docking Panel that will give users the power to jump from module to module seamlessly. Drawing from the attributes of EMS’ QuickStart Dashboards, users can add any combination module-linked icons to the Docking Panel. This will grant the user fast navigation throughout the system without having to revert to the home screen. The Docking Panel can be toggled on or off, and will sit to the right of any EMS screen, allowing the user to simply move their cursor to the right and jump to whichever module they desire, truly in one simple click. Outside of the scope of enhancing navigation throughout the system, Chemical Safety is implementing an Environmental Health and Safety Rating tool. 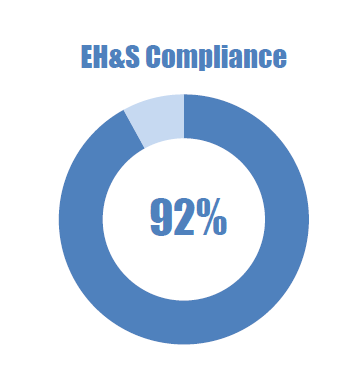 The EH&S Rating tool enables organizations using EMS to evaluate how effective they are in tracking and staying compliant in areas like regulatory reporting, workplace safety, and hazardous material management. Data and information stored in the system is used to compile a comprehensive rating so firm knows where they stand, and what actions to take in order to more effectively meet the requirements of their EH&S compliance responsibilities. These are just but a few of the new features Chemical Safety is implementing in EMS 7. 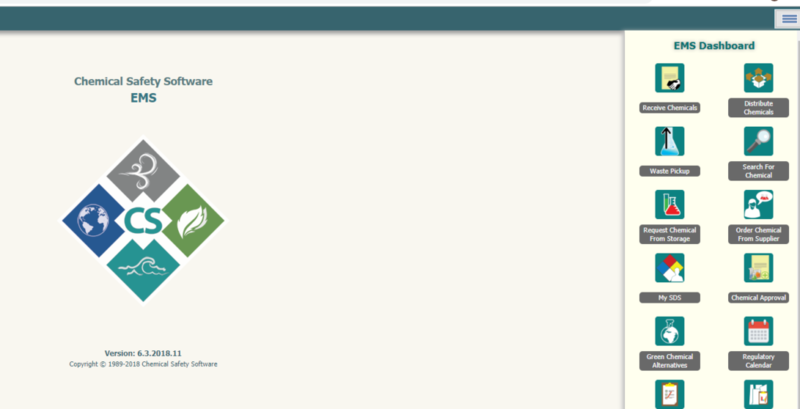 To find out more about the EMS 7 release date and added features visit or contact us at www.chemicalsafety.com.